Tube covers are used to prevent frame tubes and components from getting scratched when a bicycle is packed. They are made from foam that is sandwiched between nylon fabric and loop fabric. Covers come in 10 foot length and various widths (see table). A hook material is sewn on opposite side of the loop fabric along the entire 10 ft. length. Tube covers are custom fit to each frame by the builder or consumer by simply cutting a piece of material of sufficient length from the ten foot roll to cover any length tube. Once a flat piece of material is cut to the proper length, it is wrapped around the tube to form a protective sleeve that is held closed by the hook and loop material. Leaving the cover extra long to protect the end of the S and S Coupling and its teeth is a good idea. * It is possible to use a large tube cover on a small tube. A single bike can usually be done with one roll of 5 1/2" and one roll of 7 1/2" material. 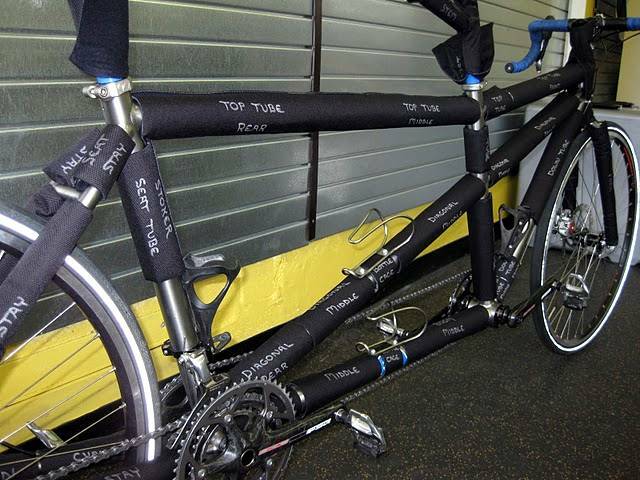 A tandem can usually be done with one roll of 5 1/2" and two rolls of 7 1/2" material. Do what others have said, just buy the covers. Anything else you think might work, won't. I tried the pipe foam and plastic bottles cut up and never trusted it. Plus, It was too hard to get the bike in the case. The frame savers are cheap (you just spent what on the S and S upgrade?) and make life easier when traveling. They are easily cut to fit and install in seconds. Seriously, buying them is a no-brainer. Bike made both trips without a scratch. I would consider them a must have.